It’s that time of year again. 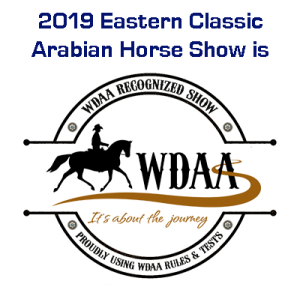 The Eastern Classic is just a month away. I have been working hard on final arrangements and sponsorships, especially sponsorships. All money brought in from sponsorships goes to making our show better and better. It pays for the welcome party on Thursday night, Friday nights ice cream social and of course the hospitality room with coffee and donuts. It also helps in any give aways that we may be doing. We have been very lucky in that the Saturday dinner break pizza party is sponsored again by Dave Bledinger of Creekside Saddlery. Again for this year I have obtained a $500 sponsorship from Big D Vet Supply arranged by Jena Ianaro, supplies the beautiful monogramed bridle bags for our championship classes. It is getting tougher every year to make the show viable, we have been losing money the past few years and I am trying very hard to make it break even or hopefully show a bit of a profit this year. With the increasing costs of facility, ribbons, AHA fees, USEF fees, and USDF fees it seems to be a never ending battle. I am writing to you as a past sponsor for your help again this year. I have attached a sponsorship form along with our member incentive program we have instituted this year. You also can use your entry form using the sponsorship line. You may reach out to me with a pledge of a sponsorship and pay at the horse show. The future of The Eastern Classic lies in sponsorship funds and I hope we can count on you this year the same as we have in years past. You have been a valued sponsor in the past. Thank you for your time in reading this. I hope to see you at The Classic, June 8-10th, 2018.